This unique religious party favor is sure to get a lot of use! Our cross design memo pads are perfect to give to your family and friends at your next Christening or Baptism celebration. Great for sticking to the refrigerator, each memo pad measures 4 1/2 by 3 inches and is accented with a pewter toned cross attached to the magnetic metal clasp. 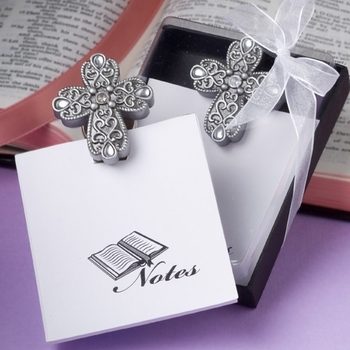 Formed from durable poly resin, the cross is embellished with brilliant rhinestones details to make this favor as beautiful as it is practical. Each is then presented in a clear covered gift box and wrapped with a white ribbon and bow. You also have the option to add Personalized Tags or Stickers with your order ($.35 each) if you would like to include a creative note to each gift box!